Book. Fiction. Hardcover. 308 pages. Published by Opus Books (HL.113098). Eva understands Hitler is married to Germany and must herself stand back unacknowledged as he enclasps the world in a passionate, python-like thrall. Until the last days in the final chapter of the Third Reich (and the first chapter of the novel) when Adolf and Eva move into their first home together, the Fuhrerbunker. 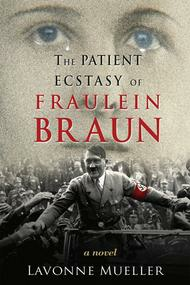 There, deep underground, hidden from the light of day and the light of history, but laid fully bare to the author's unblinking eye, Eva Braun's unquestioning patriotism and patience finally pay off – in a private wedding ceremony and a cyanide capsule. Mueller imagines the claustrophobic and morally twisted underground world of the Third Reich's last gasp. All the Fuhrer's men and women, like rats in a trap, grow more and more desperate, more and more perverse, as they compete for the final crumbs of attention from their doomed leader. Only one soul remains calm amid the chaos, the ever-patient, ever pliant paramour of the vilest man who ever lived. As the world around them goes astoundingly mad, their devotion to each other remains unsullied. Trusting. Even innocent.